When director, Bruce Burgess, asked if I would present a television series about the Inquisitions, I complied straight away. Details were not important. I was in. He had me, as they say, at ‘hello’. I have always been passionate about this period of history and had worked with Burgess before, mainly on the UK television documentary series, Forbidden History (I and II), as well as a further, yet-to-be-released project. We trust each other, which might seem strange to those who had followed the bizarre aftermath of Burgess’s Bloodline documentary, but we have come to know each other well, and we both respect what this project is about – a chronicle of some of the earlier (and most infamous) accounts of genocide. The five-part series spans the Cathar, Spanish and Tudor Inquisitions, the Salem Witch trials and more. Some of these injustices were motivated by religion, others by politics, but, clearly, what underpinned them all was that each was motivated by ignorance, intolerance and greed; and each was an unforgivable atrocity. As the weeks passed, I reviewed my reference material and looked forward to meeting up with Burgess and the team in the south of France. However, as filming neared, it became apparent that history was repeating itself and that what we were about to film was no different than what was going on in many parts of the world today, including Syria, the country bordering the one in which I live, Turkey. What was the point, I wondered. Could human nature transcend? Could it learn from its past, just for once? I arrived in Toulouse and immediately felt a bite in the air. It was autumn 2013. After greeting the team, we hit the road. Spirits were high, but the ebullient mood would not last. 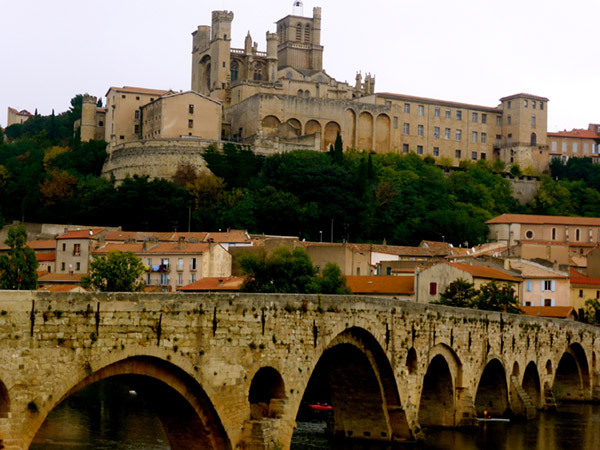 Appropriately, we kicked off in Béziers, for this is where the first of the Inquisitions took place. Here, coincidentally, or, more likely, by design, the first crusade against the Cathars, a pure, benevolent and Christian dualist movement, was fought on the feast day of Mary Magdalene, 22 July 1209. The Cathars appear to have had a special appreciation of Mary Magdalene and are purported by some to have been in possession of her (now lost) gospel. 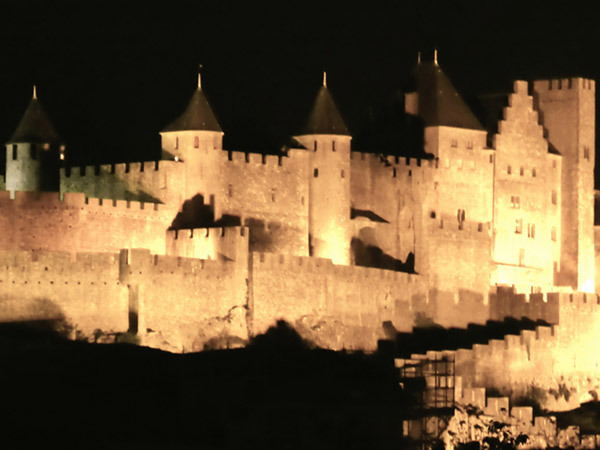 This sacred day would have been important to the Cathars and this presented an opportunity for the Church to wage both physical and psychological warfare. As the film crew got ready, I rehearsed my lines, which aptly set the scene. I tried to imagine the carnage, almost 800 years ago. In front of where I was standing a huge army of at least 30,000 men, mostly soldiers from pro-Rome northern France, had amassed around the walls of the town. 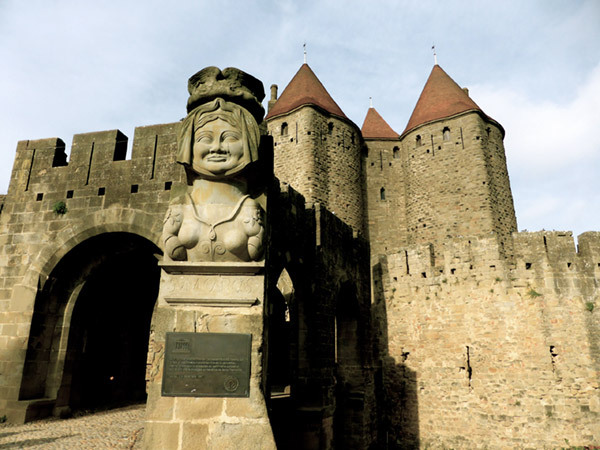 Inside were the 10,000 citizens of Béziers, guarded by only a few hundred soldiers of the local lords and barons who were loyal to the Cathar cause. Fearing a slaughter, the Bishop of Béziers tried to negotiate. The town was asked to give up its heretics or face the consequences. And so it was given a list of 222 names of people accused of heresy, mostly Cathars. But it refused to comply. Then, according to reports, a skirmish broke out at the gates to the town between some soldiers and some lightly armed locals. This resulted in most of the foot soldiers storming the gates and sacking the city. A bloodbath ensued. Thousands of people were killed, including men, women and children. It would become known as the ‘Day of Butchery’. When they discovered, from the admissions of some of them, that there were Catholics mingled with the heretics they said to the abbot, ‘Sir, what shall we do, for we cannot distinguish between the faithful and the heretics.’ The abbot, like the others, was afraid that many, in fear of death, would pretend to be Catholics and, after their departure, would return to their heresy, and is said to have replied, ‘Caedite eos. Novit enim Dominus qui sunt eius’ – ‘Kill them all, for the Lord knoweth those that are His’. Kill them all, and let God decide which are his. Could there be a more self-serving justification, and mantra, than genocide in the name of God and government? We finished our shoot and headed to Carcassonne. 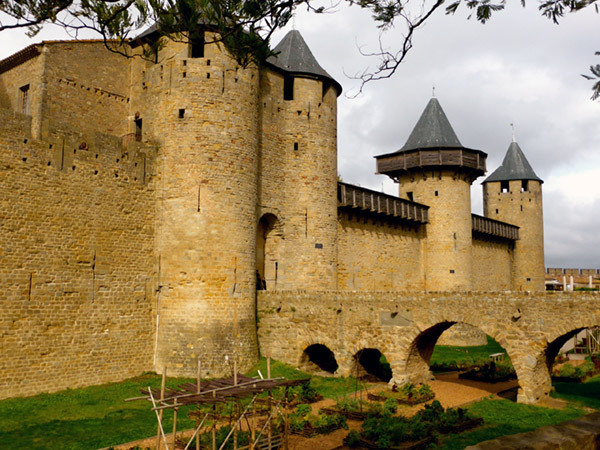 The Inquisition moved to Carcassonne a few weeks later, but news of the massacre in Béziers had arrived long before, and so a similar show of brutality would not be required. The crusaders simply shut off the water supply and waited for those who valued their lives to exit the city. Most fled with only the clothes on their backs. Although I had done my share of presenting in the past, our work in Carcassonne reaffirmed my respect, and admiration, for those who perform the job so well: presenters like Michael Wood, who makes everything look so easy. As we filmed in the busy market, I struggled to walk along the tourist-filled streets, remembering my lines, while hitting a mark on the ground, before turning to walk towards another mark on the ground, where I would deliver my concluding remarks to an imaginary spot three feet to the left of the camera. All the while, bystanders took pictures – and the mickey! ‘Cut! Let’s do it once more, just to be safe.’ That was Burgess’s way of saying, ok, let’s try and get it right this time. Fittingly, we concluded the Cathar Inquisition episode in Montségur. The famous mountain-top sanctuary of the Cathars is now a thriving tourist site and one of the most popular sacred destinations in France. We prepared for filming, before being forced to wait while helicopters lifted some of the overly ambitious (and ill-prepared) tourists from the top of the deceivingly steep and arduous-to-climb mountain to their safety below. The delay was just what I needed, as it afforded me time to reflect. Although I have been to Montségur on many occasions, visiting the site is a treat, and is always moving. 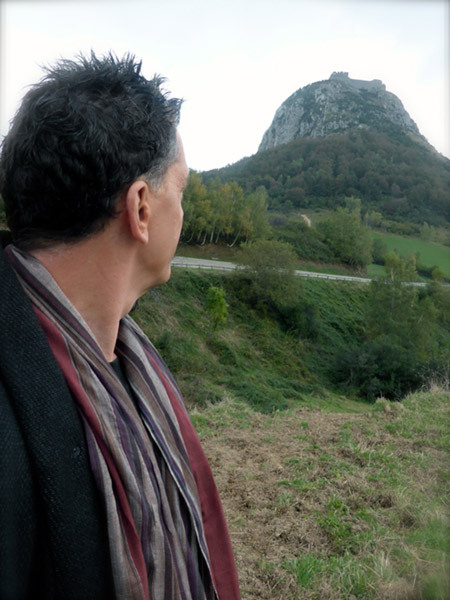 Standing at the monument to the Cathars, I contemplated what it would have been like to have walked, single file, into the pyre, as many of the Cathars did, rather than renounce their faith. The landscape is imbued and imprinted with this memory, as its name, Field of the Burned, suggests. I did my pieces to camera, but found it difficult to hit the mark. Burgess was asking for a relaxed and casual delivery. ‘Show us another gear,’ he said. The problem was that I was in the moment a little too much and found it hard – no, impossible – to be casual while immersed in the memory of it all. Disappointingly, there is never much time to savour the moment on projects like these. 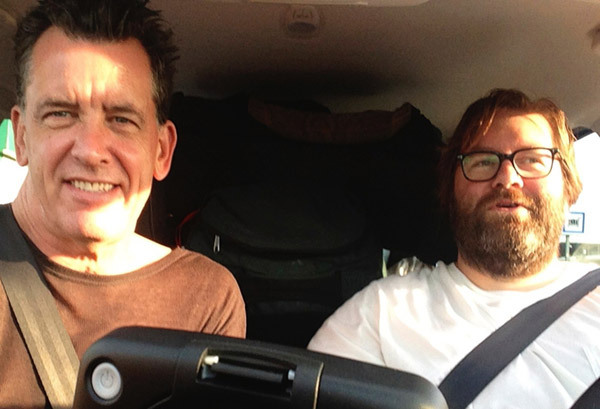 We hurriedly packed up and rushed to the airport for our flight to Spain. I said goodbye to Montségur, and wondered if we could ever reclaim the purity and innocence that religious intolerance so brutally extinguished from this land. The opportunity and responsibility to do so is ours, I thought. We simply have to choose the reality. This is a story that is simply not told enough. As a Christian myself, I am sickened and saddened at the atrocities committed in the name of Christ all those centuries ago. Knowing that my Christian faith is more akin to that of the Cathars, I often imagine that I myself would have been a victim of the Inquisitor’s flames. May the faith and fate of the Cathars, and so many others like them, never be forgotten! Thank you so much Nate. Were you able to catch the program at all? They did a really nice job I think. We need look not further than the countries that border the one I live in (Turkey) to see that Inquisitions have not gone away, and that innocent people and even whole cultures are being exterminated. Unacceptable, and on so many levels. I’ve recently discovered the magazine from watching Forbidden History then following the name here. I’ve tried to find the series but online I find that the video is not available in the US. I became interested in history through reading about King Henry VIII. Of course his daughter Mary, from his first wife Katherine of Aragon, later nicknamed Bloody Mary because of the amount of people she burned in England made me curious of the Inquisition’s true origins. I’d love to see the series and need to research more on the why’s and who’s of the true story not what the Church wanted to be known at the time and what Christianity has mostly covered over since then. I’m sorry I know I can go on forever on certain history. Thank you very much. Forbidden History Series 1 to 3 plays in the US on AHC. Series 4 is in post production and will be shown in the US in early 2017. Hi Andrew, decided to read where you have traveled, what you have seen, and your views. Wow!! I hope you found something you enjoyed.